Artist's concept of Cassini's flyby of Saturn's moon Titan. The spacecraft flies to within 547 miles (880 kilometers) of Titan's surface during its 71st flyby of Titan, known as "T70," the lowest in the entire mission. NASA'sCassini spacecraft made its deepest foray into the atmosphere of Titan Sunday,finding the hazy shroud around Saturn's largest moon to be a bit thicker thanscientists anticipated. Cassini madeits closest approach to the Saturnian moon Sunday night at 7:45 p.m. PacificTime while mission scientists at NASA's Jet Propulsion Laboratory in Pasadena,Calif., awaited news of this latest flyby just 547 miles (880 km) above the surfaceof Titan. Cassini hasbeen studying Titan and other Saturnmoons, as well as the ringed planet itself, since it arrived at the gasgiant in 2004. Its European lander Huygens touched down on the Titan surface inJanuary 2005. 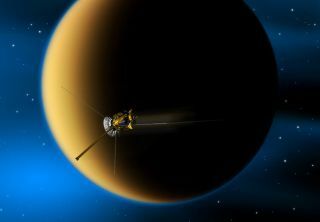 But despitethe thicker-than-expected atmosphere, Cassini stayed on target and within thesafety margins during the latest Titanflyby, returning valuable science data to the researchers on Earth. "Wehave data playbacks today at two different Deep Space Network stations to makesure we have ? as we say here ? both belts and suspenders," Webster wrote. "Engineers will also go back to analyze the data with the scientists tosee just how dense the Titan atmosphere turned out to be at our flyby altitude." This flybymarked Cassini's 71st swing past Titan. During the rendezvous, Cassini flewbelow Titan's ionosphere, which is the layer of electrons and other chargedparticles that make up the upper part of Titan's atmosphere. Missionscientists were hoping to scan Titan to look for any potential magneticsignatures originating from the hazy moon. Theanticipation among Cassini's science team was so high that Webster said waitingto hear from the probe during the flyby was almost too hard to bear. It takessignals about 78 minutes to make the trip to Earth from Titan, she added. "One ofthe 34-meter antennas at the Deep Space Network's Goldstone complex, DSS-24,was pointed at Saturn and listening for the signal that was expected to be herein just a few minutes," Webster wrote. "The data would be arriving atmy computer as quickly as they could be sent back to Earth, though there was anagonizing hour-and-18-minute delay because of the distance the data had totravel." Bycoincidence, Cassini was able to perform the flyby with its main antennapointed at Earth, which optimized communications with its mission control room,NASA officials have said.